It is important to know that for consecutive terms (like Trimester 1, Trimester 2, and Trimester 3 for example), there can't be any gaps between terms. Therefore, the beginning of the second term has to be the very next day after the end of the first term, and the beginning of the third term has to be the very next day after the end of the second term. • Click on the year. • Click on Year Info. • Type in the beginning and end date for the term. • IMPORTANT: Consecutive terms (eg Trimester 1, Trimester 2, Trimester 3) should have no gap between the end date of a term and the beginning of the next one. • Hit Save Changes button. • Hover over the Year and click on the little 'i' that appears OR click on the Year, then click on Year Info button in the first column (Below Staff List). • Click on Edit Terms. • Click on New Term button. It will add a term called 'New term' at the end of the list of terms. • Click on the name 'New term' to edit the name. 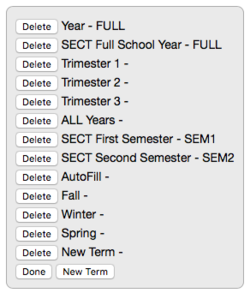 Term codes are needed for SECT purposes only so, chances are, you do not need to enter a code at all. • Click on the Done button. 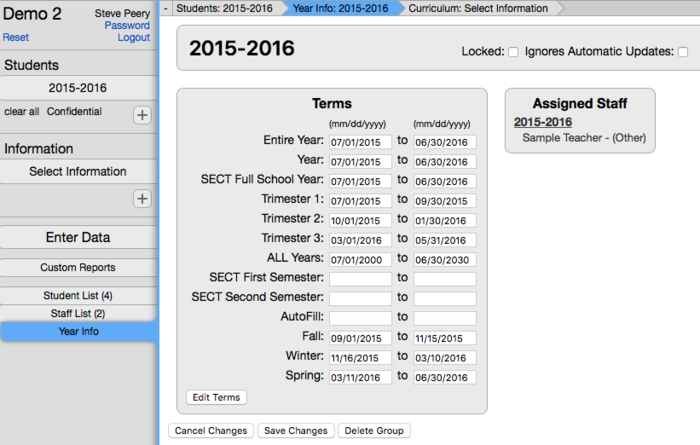 • Type in the beginning and end date for the new term you just created. • Important Note: The term you just created in the current year will also be listed for previous years. If that term is used for previous years data as well, you will need to set date ranges in the previous years too. 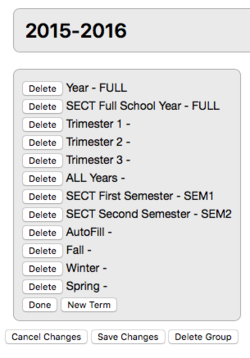 • If you just created a new term and do not need it, you can delete it by clicking on the Delete button in front of it. Click Apply Changes or Apply and Close. • DO NOT DELETE an existing Term that has been used! This page was last modified on 2 February 2018, at 19:04.